Can you feel the warm summer breeze around your bare feet? Can you taste the cold icecream in your mouth? Can imagine the wonderful warm summer evening with your husband and kids sitting outside that fantastic Italian pizzeria in town? Yes, you do? Me, too! And I totally see you in your cozy, yet stylish jersey skirt, which is just as perfect for this laid back dinner as for your walk along the beach. 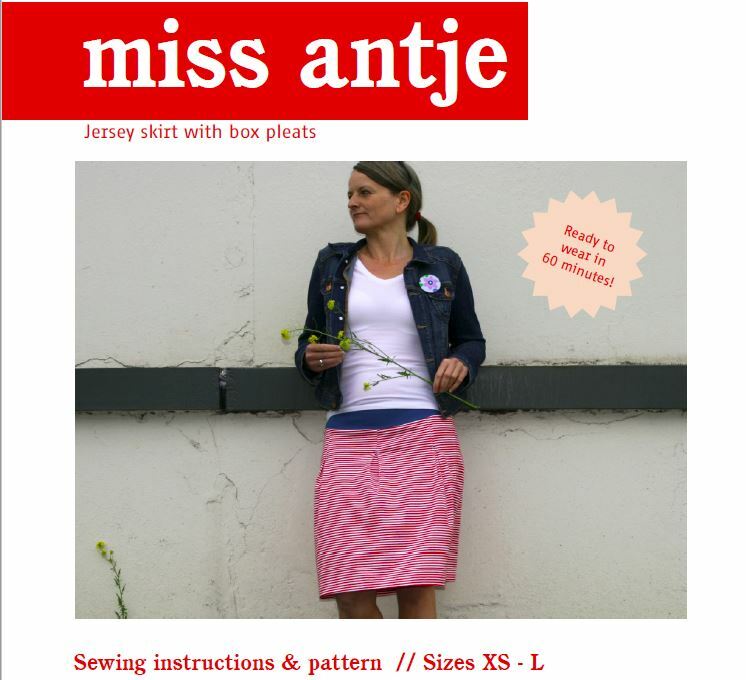 Miss Antje is a simple Jersey skirt with box pleats in the front and back, and a comfortable waistband. This makes it beautifully slim at the top, while offering plenty of freedom of movement down to the hem – perfect for relaxing summer days. Your new favourite skirt – sewn in no time with the comprehensive illustrated sewing instructions. Step by step to the finished article. Sizes included are XS-L. See pictures for size chart. The pattern includes instructions, recommendations on fabric and notions, fabric requirements, a size chart, sewing tips, instructions on printing and of course the pattern itself. The pdf includes 23 pages (9 pages manual, 14 pages pattern sheet). Please note that this purchase is for a pdf home sewing pattern of the “Miss Antje” (not the actual garment). Upon purchase you will receive an email to download the pattern. Please get in contact with me, if the email doesn’t reach you. Check your spam folder first.